The Bay Of Green Bay offers some of the finest walleye fishing in the country. The lower Bay Of Green Bay is relatively shallow with much of the bay not having more than thirty five feet of water. Depending on the time of season walleyes will relate to many different locations in the lower bay including the many rivers that flow in to the Bay Of Green Bay, also numerous shallow rocky reefs that are scattered throughout the lower Bay, and the walleyes will also relate to weeds that grow in many different locations in the lower Bay Of Green Bay. Early season just before the ice goes out on the Bay of Green Bay walleyes will begin to move into the rivers which flow into the Bay to prepare for the spring spawn. When walleye fishing in the rivers you can use many different techniques which would include Vertical jigging in deeper water, casting jigs in shallower water with live bait or using soft plastics, along with also casting or trolling crank baits. These are the best options for netting a big catch of Green Bay walleye fishing. After the spawn and as the season begins to progress you can find many of the walleye fish beginning to relate to the many reef areas in the lower Bay Of Green Bay along with using the many miles of shoreline areas. When fishing these areas the highest walleye fishing success rates will be with casting crank baits, along with jigs and soft plastics which attract the Green Bay walleye. Trolling crank baits along with spinners and crawler harnesses will also be very effective especially when the walleye fish begin to suspend in the open water basin areas. 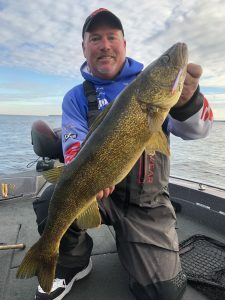 If you’re looking for one of best Green Bay walleye fishing guides in the area, look no further, Paul Delaney from Late Eyes Sport Fishing Guide Service has the experience, knowledge, technology, and equipment to ensure a top notch fishing experience for any fisherman. Get the local low down and learn what walleye fishing techniques work best on the Green Bay waters. Check out our Green Bay walleye fishing photos and fishing reviews to see what our customers have to say. Late Eyes Sport Fishing uses a Ranger 621 boat powered by Mercury with all the appropriate navigation equipment, Lowrance GPS with mapping chips, Raymarine VHS radio and Lowrance fish locators.